For those who wish to use the diluted solution (2% maximum, i.e. 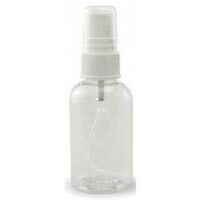 2 drops Vitalyza 3 with 98 drops of water) externally, we offer a small, 60ml, convenient to carry, spray bottle at the cost price. Only available when ordering Vitalyza 3 (it is not available separately). Silicon, in brief, is a master mineral that initiates healing and new tissue construction, (especially connective tissue and bone), strength and stability of the tissues and nerves and resistance to disease including, cardio-vascular diseases and collagen and bone diseases such as all forms of arthritis and osteoporosis. However, its role goes beyond this and is involved in all the organs in the body and even in helping to provide a stable immune system. Silicon is also thought to aid natural detoxification, especially of the lymphatic and blood systems. Maintenance use: 14 drops in at least 500ml of water, preferably divided into at least 2 doses daily. Sensitive individuals may find their ideal dose to be lower. In times of extra need: such as acute and chronic health problems the dose can be doubled for up to 4 months. A 3.5 % solution may also be applied to the body for healing of infections, injuries, diabetic sores etc. Why do we need Silicon? Silicon is acquired mainly as an infant, its concentration in the body gradually decreasing with age. The reduction in silicon content in the body with age is associated with some aspects of the aging and degenerative disease process, and conversely restoring silica storage and availability in the body sees improvements in some of the signs and diseases of ageing. However, young people also benefit from silicon supplementation in alleviation of some health problems as well. If we look to an ancient Palaeolithic diet, we see foods that are not common in the modern diet - internal organs, bone marrow, skin, tendons, cartilage, bony fish and fibrous plants, these are all foods that rich in a variety of nutrients including silicon. Furthermore, those foods that do remain part of the diet that have any significant amounts of silicon such as grains and rice, are so over-processed that their nutritional content is severely depleted. Vitalyza 3 is a water soluble form of pure elemental silicon, similar to the silicon used in the electronics industry as a semi-conductor of electricity. It works as a semi-conductor due to the plentiful free electrons that can become easily dislodged or donated to an electrical circuit (or in the body of mammals where the circuit promotes healthy cellular and tissue electro-chemistry). Once an electron is donated there is a 'hole' in the orbit of the silicon that will readily take up another electron, aiding in the distribution and transmission of electrons. Whatever man has invented, nature has invented first! We also supply Organic Silicon which we recommend for healing and rebuilding the body, This product helps with repair and cellular regeneration. It is therefore an added bonus to nutritional programmes. Organic Silicon is particularly important for collagen diseases such as arthritis, circulatory problems especially of the elderly, to strengthen the arteries and to increase their flexibility and to balance blood pressure whether too high or low. May also be good for auto-immune disorders and specifically found to be good for skin disorders and asthma. Especially good for liver regeneration and liver diseases. Choose Vitalyza 3 Elemental Silicon if you want to supply your body with cleansing free-electrons that are also a 'mother' anti-oxidant and to bring the whole family (one bottle will last 2 people about one month), towards a more healthy alkaline state and to improve the quality of drinking water, Elemental Silicon has a history of helping some serious health concerns such as diabetes and cancer support, but for cancer support is complementary to Organic Silicon. The products do overlap and may both be used for their own sphere of action. Silicon is a non-metallic chemical element, one of the 109 known substances that constitute the universe's matter, it is the most common element found in the earth's crust, including all rocks and soil, (apart from the oxygen it is combined with). In nature, silicon is combined with oxygen in materials such as sand, and pure quartz crystals. In most rocks, silicon is combined mainly with aluminium and oxygen, such as shales and clays. In mammals, silicon is very difficult to absorb from food in any appreciable quantity, although foods such as Horsetail and Bamboo can help provide small amounts, but only a fraction is absorbed into the blood. The body absorbs silicon in different ways; Silicon Dioxide is poorly absorbed and organic silica, available only in very small amounts in foods, more easily absorbed. Although pure elemental silicon does not exist in nature, theoretically it must exist in mammalian bodies for brief periods of time since pure elemental silicon is removed from organic silica compounds in the body and for a fraction of a second will exist in that form before combining with proteins to make required substances, e.g. collagen. Pure elemental silicon is still relatively inert, and can be used by the body to help form bio-chemicals and tissues as required. Pure elemental silicon has been in use as a nutritional supplement for a comparatively brief period of time, at the time of writing, since the year 2000. Toxicity tests have failed to reveal any toxicity when taken internally in the dosage range advised. The silicon is present in relatively small amounts in the liquid Vitalyza 3, a daily therapeutic dose gives 0.4 mgs elemental silicon solution, (equivalent to approximately the amount of elemental silicon available in 2mgs organic silicon). It quite remarkable that just 3 drops of Vitalyza 3 (Daily therapeutic dose 30 drops, maintenance dose 14 drops), will raise the pH of a glass of water to a highly alkaline pH, typically pH9. It is reminiscent of the nutritional supplement Michrohydrin. The inventor Patrick Flannagan, researched the most health giving rivers on the planet and found that the longevity of people related closely to the amount of free electrons in the water. However, this does not mean that the electron concentration of water is the only factor affecting the longevity of local people; electron rich waters also contain more rock dust that lower electron waters, since it is glacial melt waters that provide electron rich waters. Coincidentally, Patrick Flannagan used very fine Silicon Dioxide powder containing added electrons, and these are available in capsule form. Pure elemental silicon solution offers the advantage that as well as acting as a primary or 'mother' anti-oxidant like Germanium and Michrohydrin, the electrons are naturally held around the smallest possible receptors-individual atoms, and transportation directly to the cells in the body may be more efficient. Also there is the semi-conductor aspect where the exchange of electrons is facilitated. The great disadvantage of Michrohydrin has been the cost, Vitalyza 3 is available at a fraction of the cost. Example - 3 drops in a glass of water turns the water to highly alkaline pH9. This in turn helps to neutralise excess acidity at cell and tissue level. As health deteriorates, especially with age, the cells tend to become more acidic laying the foundation for disease and the associated adverse effects of aging. By maintaining a slightly alkaline cellular pH of 7.35 the foundation of our health is protected. To hydrate our cells there needs to be a blend of water and oil, since every cell is surrounded by an oily membrane. Water and oil/fats can blend together, to form an emulsion, when there is an adequate supply of electrons. This is demonstrated by the following experiment: try to blend some oil such as a vegetable oil or olive oil with water, for example one dessertspoon oil to 3 parts water. It is impossible. Add about 7 drops of Vitalyza 3 and blend again. It will be seen that a water/ oil emulsion has formed. Most of the body's energy is produced at cell level by ATP synthesis. This requires oxygen, oxygen facilitating enzymes and electrons. The former is provided by respiratory enzymes that can be supplied by Zell Immunocomplex. The latter (electrons) are supplied by Vitalyza 3. 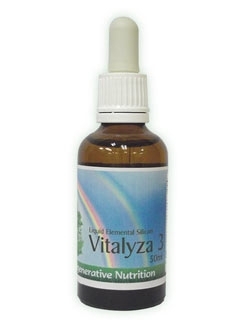 Vitalyza 3 also helps to conserve cellular oxygen. Robert O.Becker M.D a pioneer in research concerning the role and nature of electricity in the body, in his book Cross Currents (ISBN 0-87477-609-0), states that semi-conductors are present in the body and play an important role in electron transport, and hence healing/regeneration in the body. He further discusses the role of the negative charge i.e. electrons as being the initiator of cellular regeneration. It has been know for some time that chemical messengers in the form of 8 essential saccarides, play an important role in the overall health and well-being. What is not generally realised is that semi-conductors and electrons also play an important role in internal communication systems. The body is as much an electrical (and electro-magnetic) creature as a bio-chemical one. Indeed all chemical reactions involve electron exchange and re-organisation. There is much evidence to support the idea that electrons are one of the essential ingredients of healing. A dramatic example is shown with the use of Elemental Silicon lotion applied several times a day over the period of several weeks to the 'dying' toes of a diabetic complete healing and regeneration occurred. In these sorts of cases, eventually the toes and sometimes feet or legs have to be amputated. With diabetics, this sort of damage is partly due to failure of circulation. It would seem that the lotion must have helped to restore the circulation. The fact that electrons are required for general health and circulation has been discussed by Dr. Joanna Budwig, a regular Nobel prize nominee who has helped may people recover from various diseases including cancer using 'electron-rich' oils such as cold pressed linseed oil. She devised a method of protecting the oil from electron loss by blending with cottage cheese or yogurt to provide a lipo-protein that held the electrons in place. It was her contention that the combination of unsaturated fatty acids in combination with electrons is a fundamental aspect of health maintenance, circulation and healing. It is interesting to note that she attributes the origin of these electrons to the sun. Light photo-synthesised by seeds such as hemp and linseed convert the light photons to 'biological-electrons'. Furthermore, certain herbs work directly with this principle, for example Wormwood's properties of destroying harmful fungus and parasites in the body including malaria is thought to be due primarily to its high ion, i.e. electron donating capacity. Colloidal Silver also eliminates harmful micro-organisms (oxygen hating) due to electron donation. (Colloidal silver does not actually supply free electrons, but helps conduct electrons in the body). Vitalyza 3 was born through the discovery that dead fish soaked in elemental, electron rich silicon remained fresh for many months, whereas the control fish went off and became saturated with micro-organisms, i.e. went through the normal rotting phase within in few days. So we can understand that electrons delivered correctly have all these wonderful properties: disinfectant, cleansing, oxygen enhancing, healing promoting, extremely effective anti-oxidant and alkaliser. Also supportive of many beneficial processes in the body such as ATP synthesis and liberation of energy from the cell. A new form of tooth-brush called the 'ionic toothbrush' is now on sale and claimed to be an advance in oral hygiene and cleaning. These toothbrushes work by releasing electrons onto the teeth and gums. Vastly more electrons can be provided by using Vitalyza 3. To clean your teeth and gums with Vitalyza 3, add 1 full dropper load (about 1 ml) to 50 ml water in a glass or jar. Dip toothbrush into this then brush, and afterwards rinse well. Bad bacteria that the mixture comes into contact with are destroyed and the cleansing and regeneration effects of the free electrons are left to do their work. CAUTION: If there is any discomfort after doing this then most likely your teeth or gums are weak/infected. A 3 month course (minimum) of Arthro-Care may help to re-mineralise the teeth and make them stronger. We think it would be hard to find a more effective product! It should be noted that commonly available anti-sceptic mouth washes are toxic and will kill beneficial bacteria, stress the gums and remnants trickling down the throat will kill beneficial bacteria in the gut - quite a health hazard! There are a few 'natural' anti-sceptics available from the health and supplement industry they all seem to have one thing in common, they do not kill the beneficial (oxygen loving) bacteria so essential for health in the body; in contrast, pharmaceutical drugs kill both the good and the bad. It is a shame that the 'natural' anti-sceptics such as Vitalyza 3 and Colloidal Silver are not common in hospital use whereas the pharmaceutical bug killers with there harmful side effects are still being used. Ultimately the reason for this must be profit, since products like Vitalyza 3 and Colloidal Silver cannot be patented by the pharmaceutical giants. Electrical communication and conductivity in the body are regarded as health enhancers. Traditional energetic medicine recognises that blocked chi (electrical and electro-magnetic energy) is one of the common reasons for health problems and imbalance. There are many nutritional anti-oxidants that help to exchange electrons and in a multi-step process, but this is done mainly by extracting from the electron pool in the body. Only substances that directly donate free electrons can be rightly considered mother anti-oxidants. This electron donation provided by Vitalyza 3 will combine with toxins (these toxins are positively charged and are also called free-radicals) associated with un-burnt hydrocarbons / 'ash' that pollutes the body and is basically un-burnt food, to form water that is easily eliminated from the body. Also the semiconductor silicon absorbs toxins and like germanium can soak up the source of free radicals by neutralising destructive positive charges. Silicon is the element directly below carbon and above germanium in group IVa of the periodic table. It is more metallic in its properties than carbon; in many ways it resembles Germanium. Both these products are semi-conductors and donate electrons, and this accounts for most of the healing attributes such as cell and tissue detoxification, primary anti-oxidant properties, antiseptic properties, oxygen enhancement, helping with healing/cellular regeneration and production of energy via the ATP process in each cell. Since Silicon and Germanium are close to each other in the atomic table they have similar but not identical roles in helping to facilitate calcium integration into forming new tissues such as collagen and bone. The differences include the fact that Organic Germanium is slightly acid, although that does not mean it's end reaction is acidic (e.g. lemons are acidic but after metabolising the end result is as an alkaliser). The electrons in Vitalyza 3 are instantly freely available - a few drops in a glass of water reveals a high alkaline pH. We also know that the end result of consuming Vitalyza 3 is to help restore cellular alkalinity, whereas with Germanium this is not clear. Obviously the neutralisation of toxic free-radicals by Organic Germanium (as also occurs with Vitalyza 3) will tend to move the system towards a more healthy alkaline state, but we do not know to what extent the regular consumption of Germanium will have on improving the cellular and tissue pH. The daily consumption of 14 drops a day in water of Vitalyza 3 for health maintenance and 30 drops a day in water for disease states, does not seem to be particularly stimulating and can be usually started at those doses straight away, although in some cases detoxification symptoms may warrant stopping the dose for a day or so (see Adapting to the Regenerative Process for more details). On the other hand, sensitive types need to start at the minimal Organic Germanium dose and gradually increase as adaptation to the new energy occurs. So in a nut shell, Vitalyza 3 feels more relaxing/energising from the start of use and is more obviously alkalising than Germanium. Vitalyza 3 is more economical and can be added to all ones daily drinking water to make it 'wetter' to help improve hydration. Germanium has been in use for a longer period of time and there is much more information about it's potentially curative value (best source of information is Dr Asai's book Miracle Cure - Organic Germanium). Dr Asai dedicated himself entirely to the study of Germanium, his passion, commitment and sacrifice have had enormous impact upon many people's lives. Whilst it is a fairly long document, the book is recommended reading. Dr Asai found that the most healing plants on the planet contain the most germanium. Since both Silicon and Germanium have roles in maintaining health it would seem sensible to supplement with both. This need not cost any more than using just one product since smaller amounts of Germanium will be required if using Vitalyza 3. Nutrients are synergistic, and even though we know little about the interactions of many of the trace-elements, through patience and experimentation we can find out the most effective combinations, or take less supplements to obtain a broader nutrient base. pH is a measurement of the number of negative hydroxyl ions (OH-) compared to the number of positive hydrogen ions (H+) in any given fluid or tissue. The higher the pH, the more alkaline and oxygen rich it is. The lower the pH, the more acidic and anaerobic (without oxygen) it is. Maintaining the recommended slightly alkaline pH of human blood at 7.365 is critical to optimal health. An over acidic body pH is a reflection of imbalance and sets the stage for disease. It reduces the body's ability to absorb and utilize nutrients. It reduces energy production within the cells, as well as the cells ability to repair itself and detoxify metabolic by products. Chronic low-level Acidosis is believed by many researchers to be an underlying contributor to such diseases as Diabetes, Cancer, Osteoporosis, Heart Disease, poor immunity, chronic infections, and many more chronic and degenerative conditions. In order to maintain the correct Ph, as the body becomes acidic, calcium will be removed from the bones to help raise the cellular and blood pH to a level where the essential chemical processes can continue. So, loss of bone density is just one side effect of an over acid body. Every living cell within our bodies creates waste products. All these waste products must be detoxified (made inert) and discharged for us to stay healthy. Virtually all waste products are ACIDIC. For whatever reason, most of the time we do not rid ourselves of 100% of these waste products. Metabolically, living can be seen as a constant struggle to maintain alkalinity. Drinking alkaline water helps our body dissolve acid wastes making it easier for the body to dispose of them, if consumed regularly, alkaline water gradually reduces the accumulated wastes allowing the body to recover healthy states naturally. Female (44) "I am a diabetic. On Nov. 1, 2001 I was diagnosed with stage II ovarian cancer and a tumour outside my uterus was the size of a golf ball. By February of 2002, the tumour had increased to the size of a soccer ball. I was in tremendous constant pain and unable to sleep. I suffered migraine headaches and severe acid indigestion, severe weakness in my legs and had even fallen several times. I was given 6 months to live by my doctor. I started using the Alka VitaT douche and as an oral supplement. Now my pain is gone and the tumour has stopped growing and has started to shrink. In addition, my blood sugar count has started to decrease. I will certainly stay on this wonderful product." (Follow up discussion 10-03, she continues to improve and feels great). Male (49 yrs) "I had severe pain and infection a root canal procedure. I started rinsing my mouth with the Alka Vita for 2 days, several ties per day. My pain was almost immediately gone and the swelling disappeared the 2nd day." Male (76 yrs) "I was diagnosed with bladder cancer and given 6 months to live by my doctor. I started taking the Alka Vita and 3 1/2 months later, I had a complete physical. The physician informed me that they could find no trace of my bladder cancer." Male (43 yrs) "I have suffered severe Acid Reflux I have taken many drugs including Propulsid, Pepsid AD, Zantac, Prilosec, Nexium. I started taking the Alka Vita each night. From the first night and every night thereafter, I sleep like a baby and no longer have to sleep on an inclined bed." Male (55 yrs) " I was diagnosed with throat cancer and given 6 month to live. I had lost a lot of weight and had a large inflamed growth on the side of my face. I started taking the Alka Vita twice daily the first week of July 2002. By August 10th, the constant headache and pain had considerably reduced. The growth and inflammation has reduced in size and is now soft to the touch and I have started to gain weight. This stuff is amazing..."
Female (56 yrs) "I have been Type II diabetic for several years and my blood sugars average around 240. I started taking 2 oz. of the 2% Alka Vita solution in the morning and evening the beginning of July 2003. A month later, my blood sugar was 80! Now I only take 2 oz. in the evening every other day and my blood sugar of 80 remains! I plan to keep using this wonderful product for a long time." The Vitalyaz 3 I take to generally alkalise my body, as on urine testing, I am extremely acidic and this isn't good in any disease state. I am more alkaline now but the most amazing thing is that it completely removes my awful tender coccyx pain for which I had tried many things, this again was a random finding! I love this website, the information is amazing and the products fantastic! Many thanks, Elaine, 48, UK.